All you need to know to visit Portovenere and its islands. The possibility of tourist trips on boats along the incredible west ligurian coastline. 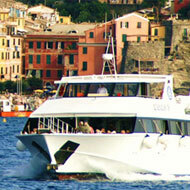 Departures from the ports of La Spezia, Lerici and Portovenere to the villages of the Cinque Terre. There also connections to other locations on the west coast : Levanto, Bonassola, Deiva Marina, Moneglia and Portofino.We also have connections from La Spezia to the island of Palmaria. During the summer season there are departures from Marina di Carrara, Marina di Massa, Forte dei Marmi and Viareggio for the Cinque Terre and Portofino.